Over a month since I posted and I’m comin’ up for air. Taking a break from work and such for a night and trying to put together a post. Since last writing my family has visited, I went to Boone for a bouldering competition and just got back from San Diego for the American Public Health Association’s annual meeting. It was my first time really staying in San Diego and, like everyone, I was attracted to its beauty and weather. However, I feel like that’s what makes it for San Diego. While it feels Californian, I don’t think it has that unique identity that San Francisco and Los Angelos each claim for themselves. There was a lot of getting around by skateboard though, and I always find that cool. Also cool was the fact that Chad came down from Santa Barbara to hang out for a day. We watched Michigan football (lose), talked about iPhone apps and explored the environs. When looking for coffee, he brought up the Clover. I had no idea what this was but Chad’s enthusiasm about the device (or the coffee) was enough to capture my interest. Chad just finished his PhD in materials science and engineering. As you might expect that means a lot of time spent in the lab with other compatriots. This also means lots of coffee. Chad’s group used thermal couples around the lab to control the temperature of water for brewing in their French press. Leave it to engineers to take coffee precision to new decimal places. The Clover was designed by Stanford mechanical engineers with the perfect cup of drip coffee in mind. Chad’s mention of the machine planted the Clover seed in my head, now we had to find it. 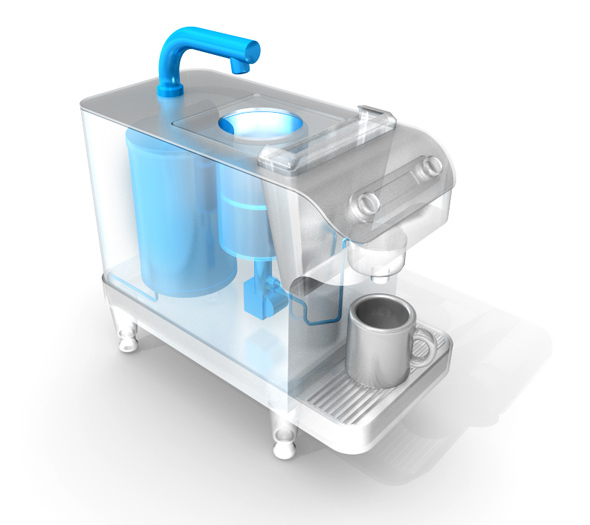 The machine costs around $11,000 and makes only one cup of coffee at a time. But to call it one cup of coffee is an injustice. I found a coffee and tea shop near our hostel and not knowing the level of coffee snob-dom that the Clover represented I suggested we go there to look for it. The place had knick-knacks from countries that grow coffee and a regular espresso machine (ho-hum). However at the mere mention of the Clover they immediately pointed us in the right direction. There may only be one place in all of San Diego with one of these coffee brewers but the legend of it was obviously pervasive. We were off to Caffe Care Diem. We weren’t after this thing Amazing Race style, the Clover is a cultist (cup of coffee could be over $5) thing and we knew it would be there later waiting for us. So we meandered over to Coronado and to the beach. Later when we wanted some coffee – that’s when we started after the Clover. The Carpe Diem we went to was the wrong one, however. Once again I marveled at the way the servers responded to our inquiries about the Clover. It was almost mythical. Everyone knew what we were looking for and had heard about its presence in the greater Metropolitan San Diego Region. Our patience again prevailed and we took our regular coffees with us as we checked out the park. Chad had some work to do later that night and did not want to start back too late to SB, but we had one thing to do. Drink the Clover. We found the shop and prepared for our experience. Upon initiating the Clover process I immediately knew that I was in over my head. I do not consider myself a connoisseur of anything and know I was choosing the beans that I would be drinking at their fullest potential in just 5 minutes. The barista’s knowledge, on the other hand, was intimidating. I got sentimental and chose Colombia. Upon serving she noted the what the roast was known for and what to look for as it cooled. I tensed up about adding anything to the brew and took it black. And here’s the rub, you really need to have beans of adequate quality to justify such a luxury. Also, you need to know your coffee. As with other gourmet and ‘fancy’ experiences of the pallet I think half of it is the ceremony and for that, the Clover is worth the hype. The machine is sleek and study, and the attention I was given with my order was nice as well. The Clover is also connected to the internet so that the temperature and time of the brew for your bean of choice is guaranteed to be spot on. Since returning to Atlanta I have looked for, and found, a Clover near me. Not surprisingly, it’s at Batdorf & Bronson and of course in Decatur. I am not sure how much I will indulge myself with the Clover, but at least I know it’s there. The company was recently purchased by Starbucks, so look for it near you. Batdorf’s! Go Olympia, WA! I haven’t seen a clover at the Olympia shops, I’ll have to look next time. a. i almost overpaid $5 for coffee the other day before i knew what this clover thing was — now i’m almost convinced i should try itb. i went to an amos lee concert the other night, and his mannerisms were strangely similar to you! Who is Amos Lee and what kind of coffee were you going for that was $5? You never said how much a cup of this coffee costs. so….? The place that we went to was still trying to promote the machine and so it was only about $2.50/cup. But Chad told me that they go for about $6 regularly.